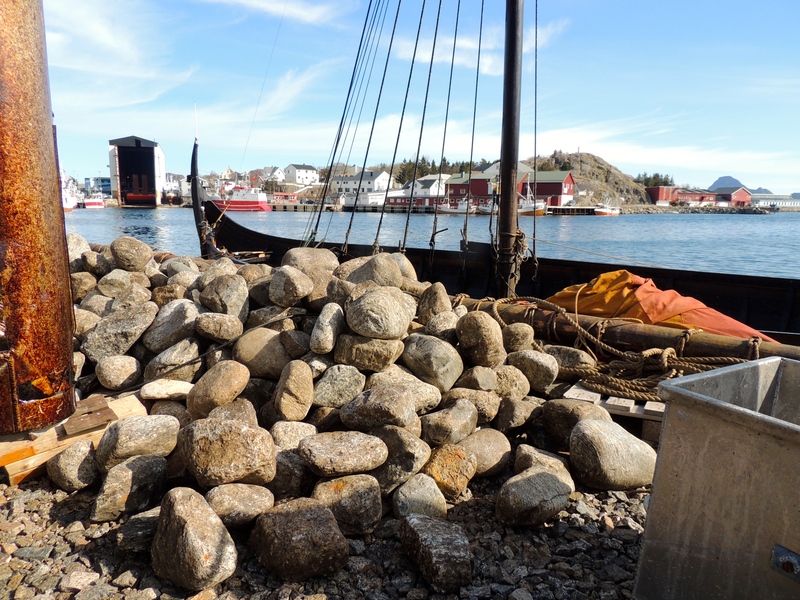 We pulled into Ballstad harbour the next morning to where ‘Lofotr’, the Museum’s Viking longship was lying. Ballstad is one of the oldest and largest fishing villages in Loften. 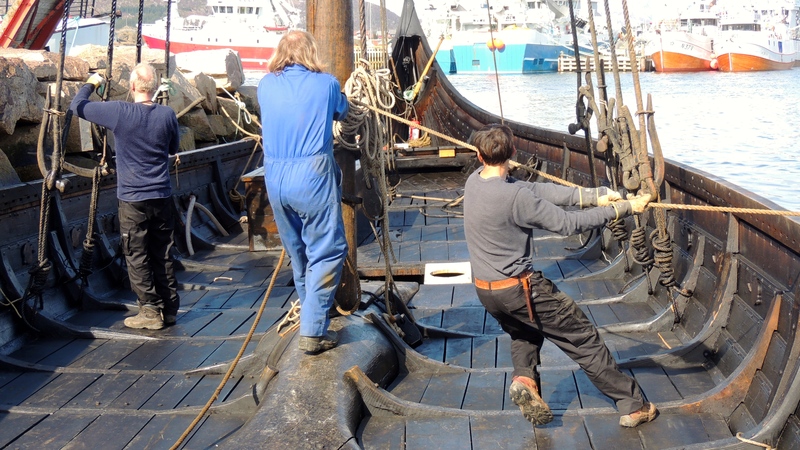 Divided into three parts for vessels of different sizes, it is the archetypal picture of the Norwegian seafaring tradition. Several bright pastel coloured cabins stand around with open doors in the salty, fish scented air. A cafe in the distance serves the odd sailor or fisherman that stops by, where whalers and coastguards drink coffee and wait for a signal to move. A cruise ship hanger stands out on the other side of the harbour, appearing almost the size of the jagged mountain that overlooks the village. While packed into almost every corner of the harbour, thousands of headless cod-fish hang upside down by their tails on wooden racks, drying in the summer heat before being shipped off to Italy. A few old men stood around a large steel box, bolted shut and dripping water at each of its corners. 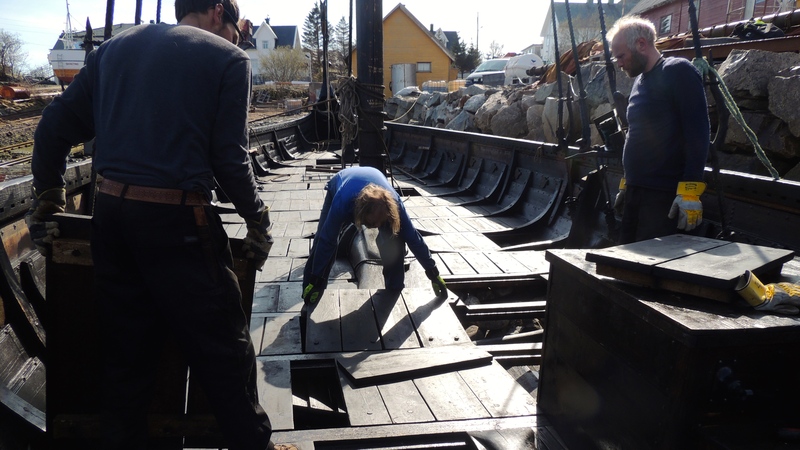 “They are steaming a plank” Terje said as we climbed out of the truck,“they are replacing one of the broken timbers of an old fishing boat”. The oldest of the men shouted good morning to Terje as we walked over. He said something in Norwegian as Terje introduced me. Taking a hand that felt a few fingers less than mine, I recognised him then from one of the videos in the museum’s exhibition; Erik Harald Bjerki, the farmer who first discovered the site at Borg while ploughing his fields; now carrying out just another everyday task familiar to those who live here. After a number of laughs and some serious nodding of heads, we made our way down to where our ship was lying; black and sweating in the sun; a thick smell of tar wrinkled my nose. 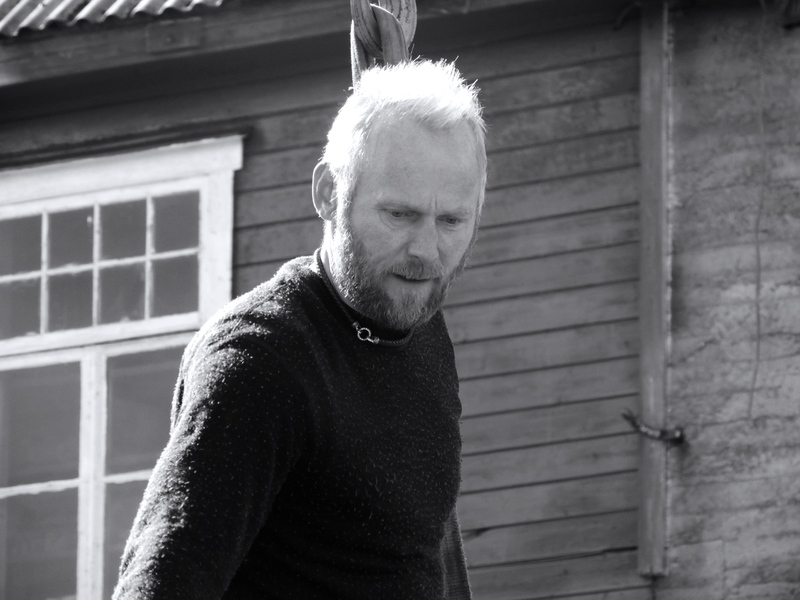 “She has been surviving the winter” Terje said proudly while standing over the pier. The weather in Lofoten had apparently been quite rough this year. 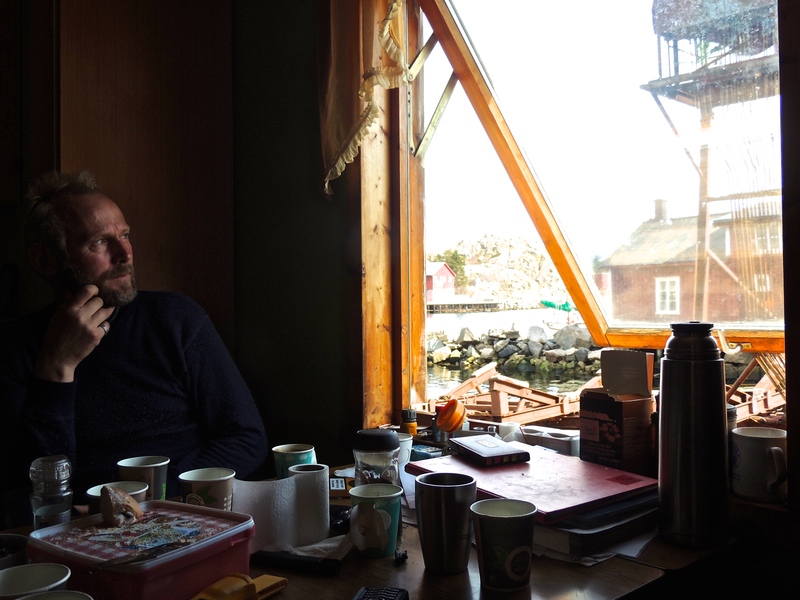 A colleague who was with us, Jared, an American sailor and ship builder, told me that the island had suffered several harsh storms over the winter and at one point even a hurricane, taking with it, a boathouse and the two boats of one local sheep farmer; leaving one completely destroyed and the other still to be accounted for. Jared threw his bag onto the ship as he leaped from the edge of the pier and grabbing one of the tall, tar stained ropes, he swung himself aboard. 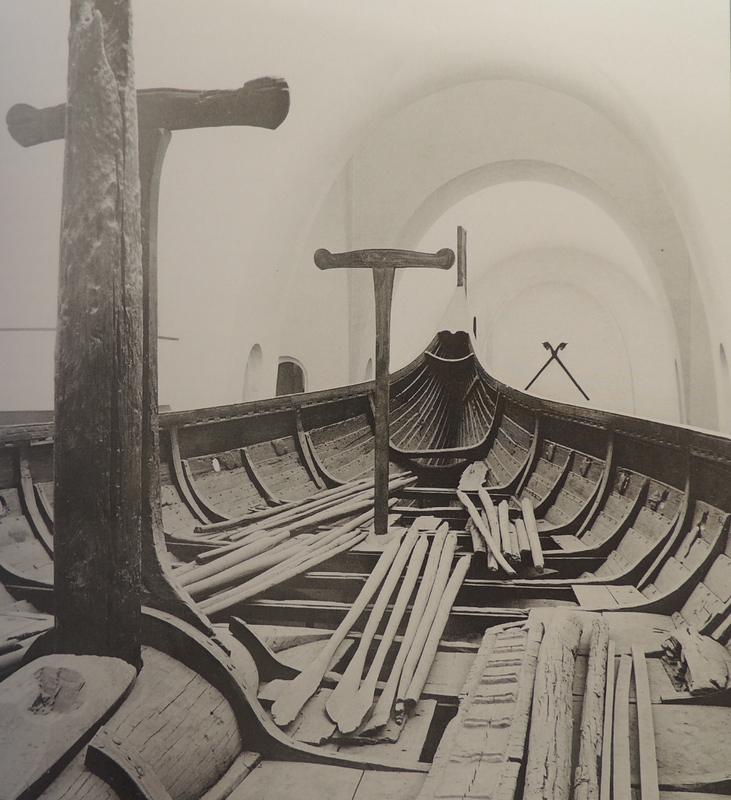 Although ‘Lofotr’ now lay still in the water, stripped of its mast, sail and decking, its axe shaven physique and its bulging black sides made it appear all the more lethal among the crowd of bobbing, white boats. It was reconstructed in the 1990’s when the museum first opened its doors. 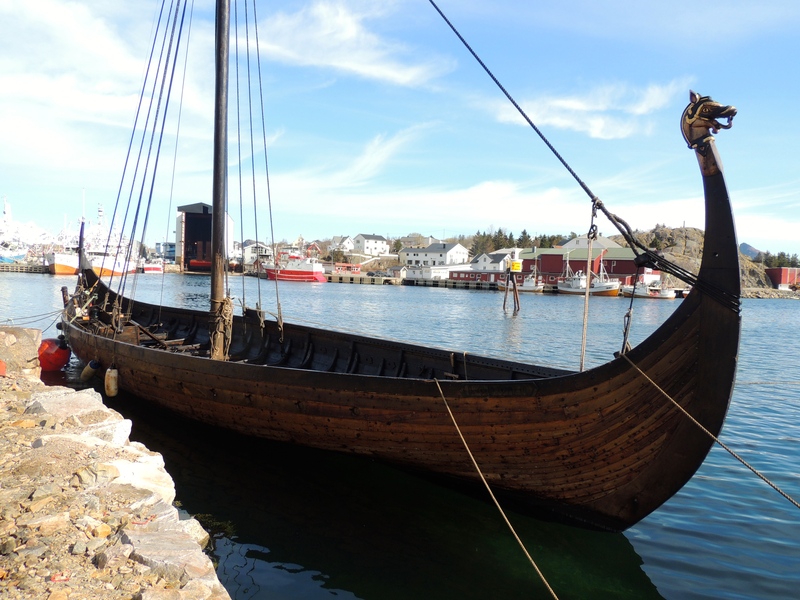 Most of our knowledge on Viking ships is derived from two key discoveries in southern Norway; the 9th century Oseberg and Gokstad burials. 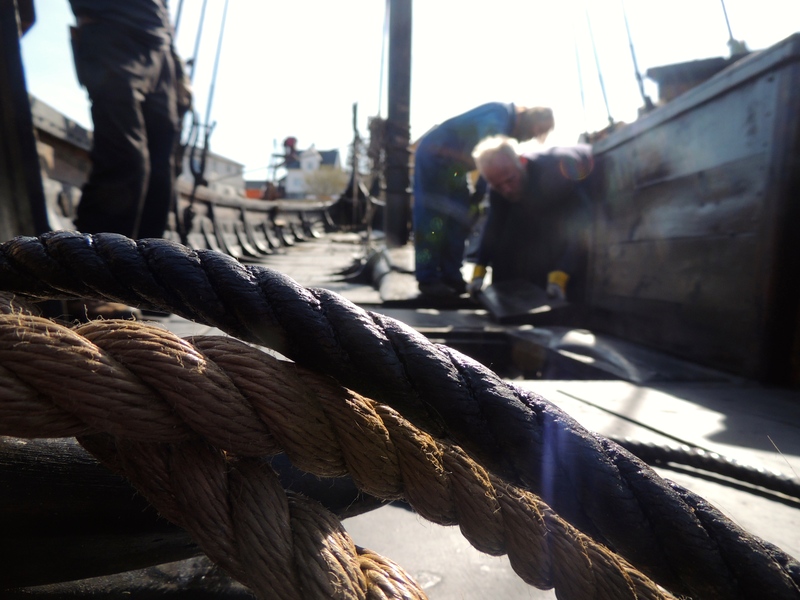 With an active crew and a sea life of over twenty years it was now ready for another season. 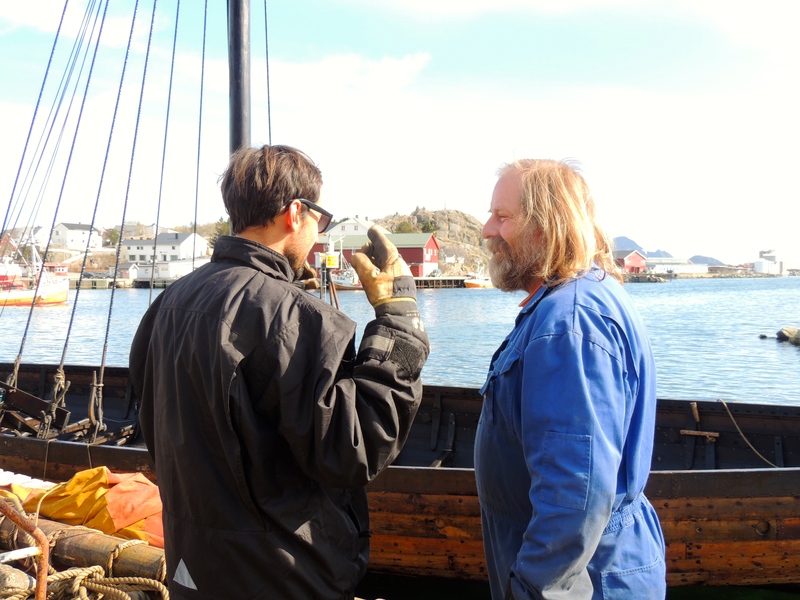 I hadn’t really sailed much before coming to Lofoten, but after my first trip it was as though I caught a bug; not many people get to say they learnt the ropes (literally) on the Gokstad. A man in thick black overalls stood by an enormous pile of rocks, tinkering with the remote control of a cherrypicker. “Today we have to load the ballast” Terje said. “We need to put the rocks into the underneath of the ship to give it some weight. He held out his hands and turned them from side to side. “We have to adjust the balance because, without something to weigh down the ship it will turn over”. I only ever considered how the ‘wood’ effected the sailing capabilities of a ship. Throughout my summer sailing last year, I never once considered that it was actually the several tonnes of rock beneath me that was keeping us afloat. In fact, if you had asked me then, I would have suggested it a bad idea; simply from an amateur fear of sinking. Though it seems as long as people have sailed in such a way to other places, they have literally been bringing a piece of home with them only to then leave a piece of it behind when they turn home. Amelia Island in Nassau County, Florida today is littered with hundreds of ballast stones from Colonial times, originating from New York, Virginia, England and Spain. 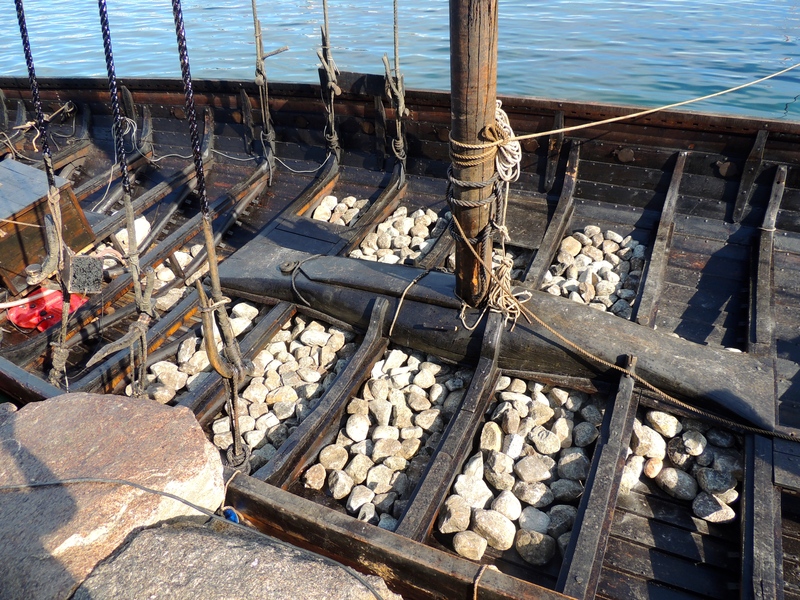 Traders would fill the hulls of their ships with local stones, dump them in Amelia and then sail home again; their ships weighed down with fresh cargo. The cherrypicker lurched as it lowered a heavy steel crate down to our feet. 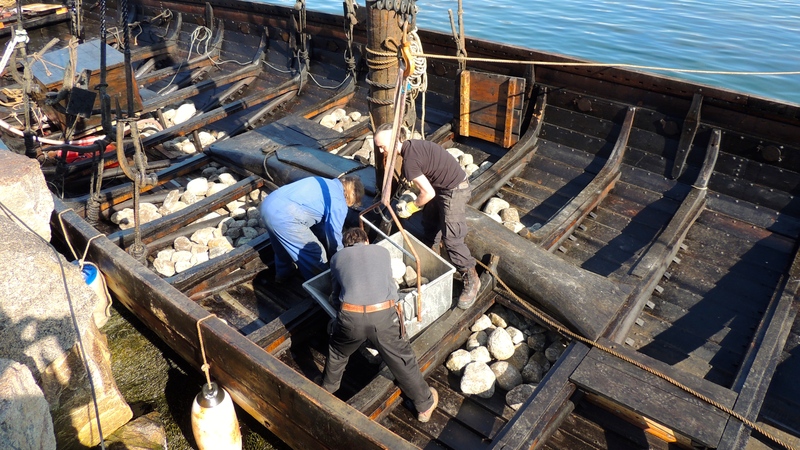 There we spent the morning and afternoon filling it, first with smaller stones and then with bigger ones; slowly feeding several tonnes of rock from the pier into the belly of the ship. I grinned at what an early medieval Scandinavian would think of our giant iron scorpion, levitating his rocks onboard in a box of pure steel. 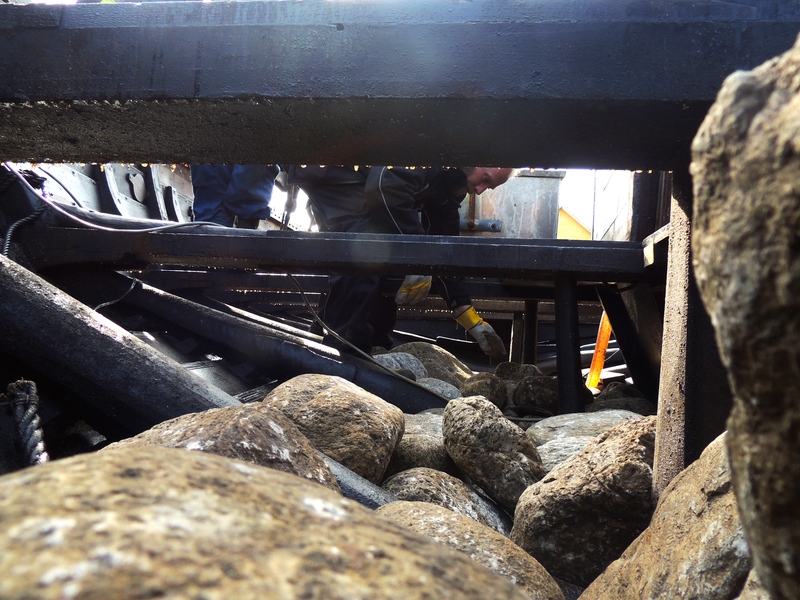 As the pile progressed to pebbles, we fitted the decking planks once more. 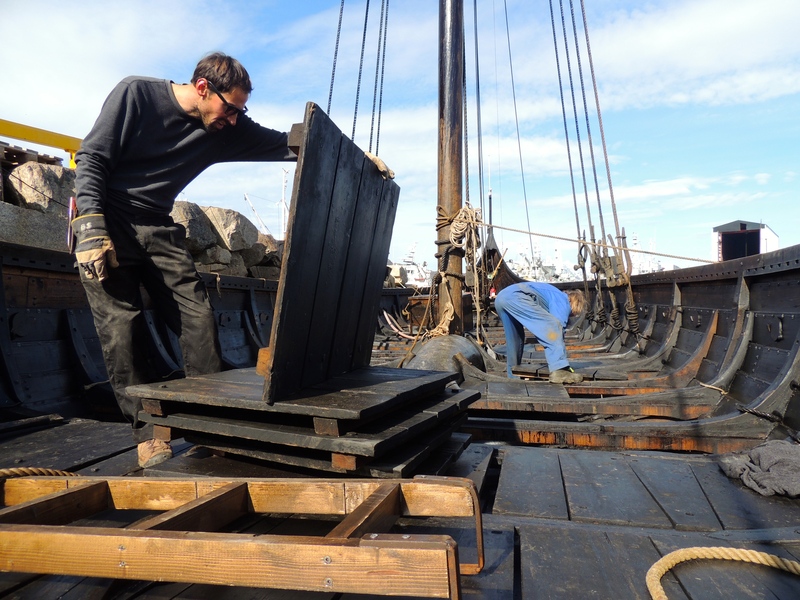 As we fumbled with its deck boards like pieces of a giant oaken jigsaw, Lofotr began at length, to resemble the shape that I remembered. “I grinned at the thought of what of an early medieval Scandinavian would think of our iron scorpion, levitating his rocks onboard in a box of pure steel”. We had lunch in a nearby cabin. I unwrapped my sandwich on a table of empty coffee cups, cigarette butts and slice of stale leftover cake. As is usual among sailors, the conversation meandered along the topic of boats and their many types of construction; of old ships and new ships, big ships and little ships, and the shipbuilders of old; their techniques surviving in local memory and living on in the vessels of later generations. The conversation turned over in my head on the drive home, with one theme that stood out; the individuality of each ship builder. Each one they admired seemed to adhere to particular method and form, but changed it slightly with some personal adjustment. These are the fascinating human aspects that drive change; the changes we see in typologies and morphologies. I thought of the many Viking Age bow and arrow fragments that we found all over Ireland and Scandinavia, each one the same form but slightly different in style; personalised. I thought of the varying medieval house designs that stood in view of the Chieftain’s house here at Borg, there timbers now gone, but having slowly changed till their end. 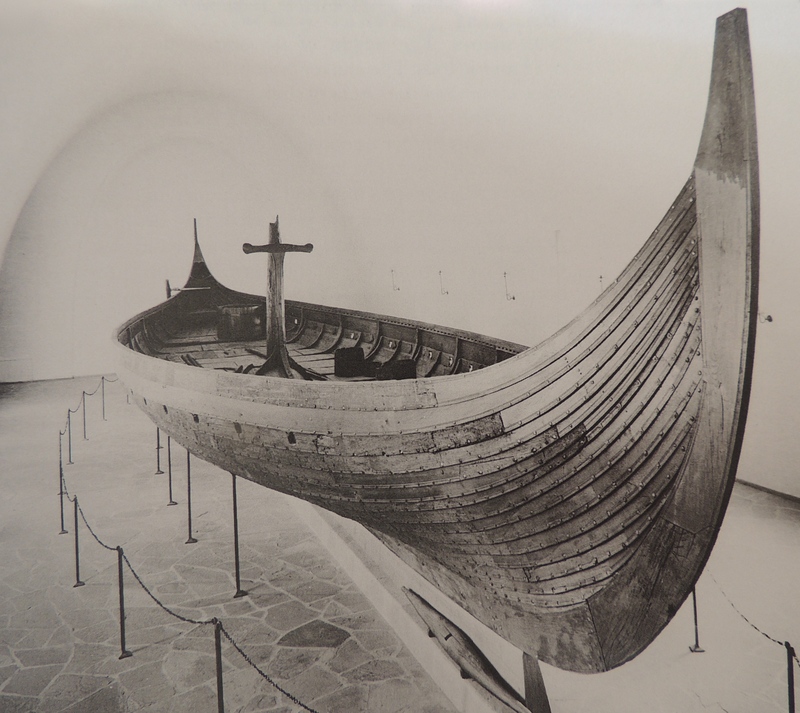 And of the Oseberg and Gokstad; two ships representing an entire Age of sailing and yet different though only a century apart from each other. I would love to speak to the original makers of these vessels; to see the many other ships that once filled the harbour at Ballstad; the ones that came before, those that came after and all those in between that never made it to the museum. Ah Stephen, that was a brilliant read. Keep them coming.